Well, I live in Crystal Lake, IL, which is the town where I was born. Most of my immediate family comes from there. I graduated from Crystal Lake High School in 1993 and went to the University of Wisconsin at Oshkosh for a geography degree, but was sidetracked by landscaping. So I came home to seek out a certificate in landscape design and maintenance. From there I started my own landscaping company. In 2001, Patrick Sullivan offered me an opportunity to come to work for St. Alban nursery. Subsequently, I was offered a job as a landscaping crew chief and at that time the landscaping business was becoming so cut throat that I thought it would be better for someone else to pay the unemployment insurance. So, I went to work for Patrick and in November, when everything was closing down for the winter and they were laying everyone off, I went in and ask Patrick for a job with the trains part of the business. At that point he put me in the warehouse doing packaging on trains. The first year was a little tricky, as Patrick was a very interesting man. He laid me off in February with the intention that I would probably be done in trains. So I went back to work in the nursery. Before he could even finish the statement, I said to him, “Pat, I am not going to make the same mistakes, but I will make all new ones.” So from there it was basically trains for the rest of my life. I did landscaping work until 2006 after Patrick died and then John needed help in the office, so I moved into the train store full time and have been doing trains ever since. 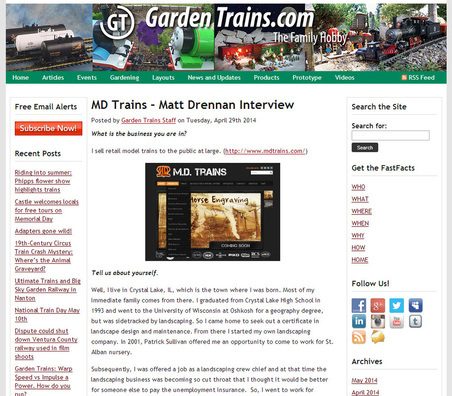 Did you have any interest in trains before you started in the business? I had several small Tyco, HO sets and my great uncle and second cousin had a full-sized HO-scale train setup. It was an 18’ X 20’ layout, and whenever I was over at their house, I got to play with it. It was a lot of fun, but I lived in a town that had a commuter railroad, and the big joy in my life was to go down to the train station, after school, and pick up my father when he came off of the train when he came in from Chicago. I would go into the station and watch all of the trains come in and out and wait for him by the car and that is really where it all started. Tell us a little about the transition from St. Aubins to your previous business at WI Trains. Well, we all know that Jason Sullivan decided to close the train business down in April 2012. My wife and I realized we were going to do something after I had put in a bid to buy the company. The bid was too little and too late. It just took a longer timeframe than was allotted for me to put in a bid. Due to circumstances beyond my or my family’s control, Jason closed the store. My wife said to me, “You really like doing this?” I said, “yes”. So she said “OK, let’s try it.” So at first I investigated doing it on my own and realized that to have a storefront and everything else, just to get started I really needed partners. There were a couple of people who were available who I had sold to over the years. They expressed an interest in having a store only if I would join them. I contacted them and that is where WI Trains came from. We opened June 11. What happened to WI trains? Truthfully, it was an investor-backed business. The money came from the investors. After nineteen months and not showing a profit, although it takes two or three years to show a profit in this business, the decision was made to close the business. The partners didn’t want to put any more money into the business, so we closed. After about five days of shellshock, trying to figure out what was going on, I started getting phone calls from people asking if I was going to go back in business for myself. I also get calls from vendors asking if I would still be willing to sell their products. So my wife and I sat down again and had a very long heart-to-heart discussion and made the decision that we would open a new business. So we are running MD trains allowing me to continue to do what I like doing. We set the business up out of our home. It is an on-line and over-the-phone business and doing shows with the ultimate goal of having a storefront again. But because I am doing this solely on my own, it is basically a sell the order and pay for the product type business. I am not stocking product from vendors so that I can keep my costs in check. That means I will wait on that storefront until the first half of the business model proves itself. We have a written business plan that we discuss. It is a rough plan but basically, the first year we will open the website, which we have done. We will establish a very large social media presence, which I have pretty well done. That is really important for any train store in this day and age. We have also started an outreach program talking to different Large Scale railroad clubs. And we are also doing direct advertising. In the second year, we will expand our program of outreach to clubs. We will be offering discounts to specific clubs for certain things. And the schedule would say that we would establish a small store by the end of the second year. A small addition to that is that we know that to carry certain products, you must have a storefront. So I have modified the plan slightly to establish small store kiosks in locations such as the Botanic Gardens. With WI Trains, where did most of your business come from? The majority of any of these train businesses comes over the phone. Internet business is growing, but a lot of the customers don’t really use the Internet much. Or they only use it for research purposes and are not your typical online shoppers. However, that is changing. There are more Internet shoppers every day. But the majority of them are still calling you on the phone to place their orders. You do get walk-ins and you have to have a good presence for that. That takes a while to establish. I would rank it as phone, Internet and then walk in. Tell me about your social media presence. We have established a Facebook account, as well as a Twitter account and we are working on a You Tube presence for the videos that we make for the different things I want to promote, and our website. The first thing we want to promote is the Phoenix Unlimited motor cleaner and lubricant, and we have a very good video for that. We are talking about doing one for their track conditioning fluid. So for now those are the four locations, however, we have established Linked In accounts and I try to be present on as many forums as possible. Who does your website and your social media presence? I handle all of the updates and content. But I have a very good group of friends who established a business called City Square Solutions about the same time that I was establishing WI Trains and they have the people who have helped me get the website where it is today. I get a lot of compliments on how the website performs and operates and a lot of that is due to what they have done. I want to talk about your products. For locomotives and rolling stock it seems that you have Bachmann, HLW and Piko as the only ones you are currently offering. You said before that some manufacturers have storefront requirements. Is that what is limiting you to those three currently? In the case of USA Trains, yes. That is why I have had to modify my plan a little bit. My goal is to add them to the website. I want to do that within the next month or two. So I must get the kiosk operation I have in mind off the ground. In the case of LGB, it is pretty much a time aspect. It will take a little longer to establish LGB. But the goal is to offer products from as many manufacturers as possible. The same is true with Accucraft. We hope by Christmas time all that will be in place. Everything we have talked about so far is Large Scale trains. Is that going to be your focus completely? Well Large Scale is what Pat taught me how to do, however, with what I have learned since; it is not a good idea to ignore the other scales. So I do offer products in other scales that are made by any of the manufactures that I do sell. I don’t have them on the website, but I do offer them. I can do Williams O-scale, Piko and Bachmann in HO-scale. You may laugh at me, but I am a trolley guy. I always have been. It might have something to do with the fact that the Illinois Train Museum is so close. So I have tried to get everyone of Hartland’s models and have the Aristocraft PPC. All in Chicago markings. So any Chicago based trolley that is out there, I will try to get a model of it. That includes the upcoming Bachmann Peter De Witt, which is really impressive. Do you have a Large Scale railroad? I have a temporary Large Scale railroad. Since I live in a townhouse, I don’t really have much room for one. I do have a point-to-point that runs from my neighbor’s deck to mine for my trolleys. It is about 40 feet and I have it up during the summer. My office is in the basement of my townhouse and it has a nice window that is at ground level and that makes it pretty easy for me to put things on the track. You weren’t at the ECLSTS and I understand that you weren’t ready yet, but what do you have in mind for train shows in the future? Right now I plan to be at the National show, but don’t currently plan to have a booth. Going forward I will be doing smaller shows in my area and plan to be at the ECLSTS in the fall and Train Fest will probably be my large show coming out party. It is also my intention to never miss another York. What do you consider the best part of your business? I enjoy the interaction with the customers. I think we all know that I am a little bit of a “goof “ sometimes, so I have a lot of fun talking and interacting with people. I got all of the good aspects of my grandfather and grandmother. Their great customer interactions and their ability to make friends have impacted me. So seeing friends and talking to people are where it is. What do you think of the future for Large Scale? Truthfully, I am probably the only guy my age opening a Large Scale business. I am also one of the few people my age even involved with Large Scale. But we need more of them. We need people who realize that this is more than just grandpa’s toys in the basement. This can be an interactive hobby for the entire family. It includes every aspect from landscaping to design, construction, mathematics, electrical and electronics. So I feel that if you can get more exposure and get more and more public venues, which is happening, you might be able to catch that next segment of the market. But if those public venues aren’t available and you don’t have the backing, then this whole hobby in the next thirty-years, could become something that is considered a relic. What about the clubs? You said you got a lot of your business through your interaction with clubs. Can you talk about that? There are a lot of clubs around the country that people don’t even know about. For example, did you know that there is a club in Tulsa, Oklahoma? It is a 40 to 50-member club. They are affiliated with the Route 66 organization and are making a bid for the National Convention in 2017. That is one of the clubs that I work with a lot. That is a club that has some very aggressive and dynamic people involved. I am working with several clubs that are forming all over the country and are being formed by people who had previously only been in the hobby by themselves but are now interested in being with others who enjoy the hobby. In my view, clubs are the advertising arms of this hobby. They need to have proactive and forward-looking people involved in their organizations. How do you find these clubs? I find them through Internet search. I do a full Internet search and I also talk with my customers. I just ask if they know of any clubs in their area. When I go to a show, I look around and ask the customers who come into my booth, if they know of any clubs. I try to get the names and contact info for the president and Webmaster. I then follow up with them directly. I do a lot of things that other dealers don’t do. Many of them have the idea that sales will come to them, but unfortunately, those days are gone. You have to seek out the customers. Is there anything else you would like for us to include in the article that we haven’t already talked about? I guess that I just want everyone to know that this business and hobby is a passion of mine. It is just amazing. It can be very beneficial to people of all ages. But the key is that people have to be willing to get involved and do a little bit of the work. It seems to me that one of the barriers to entry to this hobby is track. What do you have to say about the high cost of track? Although track is pretty expensive when you try to buy it all at once, but what a lot of people don’t realize is that there is a lot of, for this time, reasonably priced track. You just need to know where to look. There are companies out there where you can start with track that is more reasonably priced than you would think. But you also have to keep in mind that this is a hobby. If someone is going to get started in any hobby, there are start up costs. And, these costs can be spread over time. You don’t have to buy all of the track you will eventually need at the beginning. A lot of people grew their railroads from a little circle around a Christmas tree. Matt, thank you for talking with us. Best of luck with your business. Hope to see you at York in the fall.